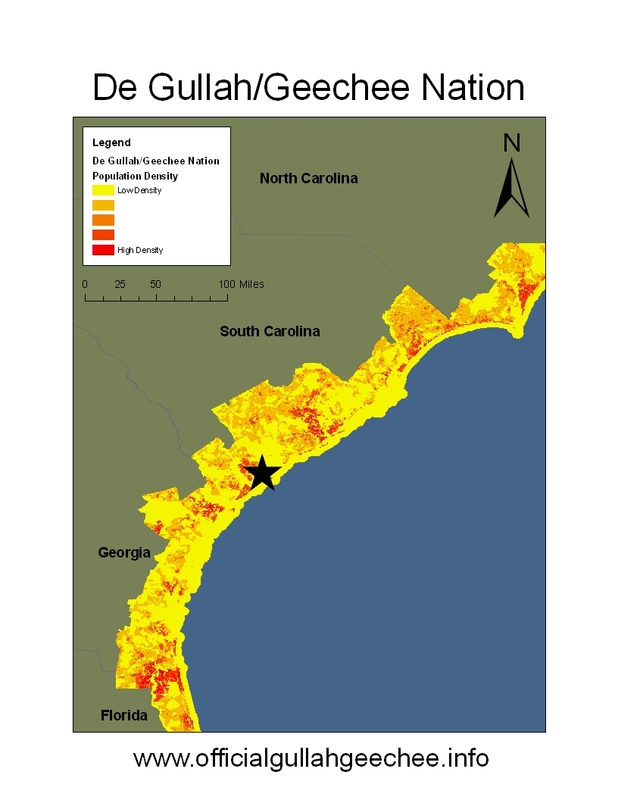 In celebration of the International Decade of People of African Descent, Gullah/Geechee Nation Appreciation Week 2015 will be celebrated throughout the South Carolina, Georgia, and Florida portions of the Gullah/Geechee Nation‘s coast July 25-August 2, 2015. Queen Quet states, “We gwine tru de coast fa keep de culcha!” The week will be a journey into the living traditions of native Gullah/Geechees as those that want to learn about this unique indigenous national linguistic and ethnic minority take Gullah/Geechee owned and operated tours to Gullah/Geechee businesses and historic sites . Everyone is invited to come out and enjoy the events that are highlights of this nine days of activities which will honor the lives and legacies of the Emanuel 9. 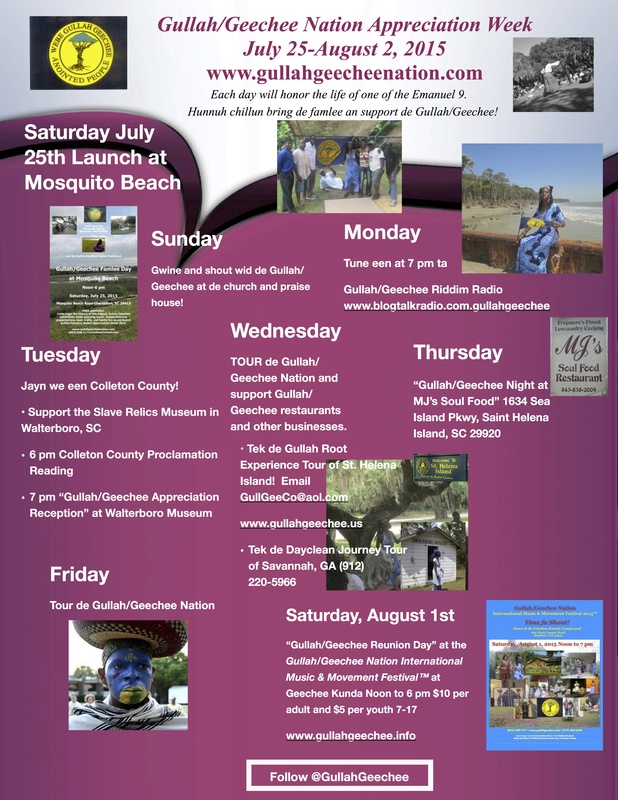 The Gullah/Geechee Nation Appreciation Week launch will take place at historic Mosquito Beach in Charleston County, SC The celebration will continue with participants going to traditional Gullah/Geechee churches and praise houses on Sunday, July 26st and August 2nd in any county along the Gullah/Geechee Nation‘s coast. On Monday, July 27th people are encouraged to support Gullah/Geechee businesses including restaurants as well as crafts people and artists by going to their stores or purchasing items at their websites and online stores. The Gullah/Geechee Nation‘s online store at www.gullahgeechee.biz has a wide selection of items. Throughout the week, the Gullah/Geechee Sea Island Coalition will tweet the websites of native Gullah/Geechee business owners and artists that are participating in Gullah/Geechee Nation Appreciation Week. So, make sure to follow @GullahGeechee to keep up. Also, at 7 pm on Monday evening, Queen Quet, Chieftess of the Gullah/Geechee Nation (www.QueenQuet.com) will host the online celebration via Gullah/Geechee Riddim Radio which is the official radio station of the Gullah/Geechee Nation. It can be heard around the world and archived episodes are available for online listening at www.blogtalkradio.com/gullahgeechee and can be downloaded FREE at iTunes. On Tuesday, July 28th, participants in the celebration are encouraged to go to Walterboro in Colleton County, SC to support the farmer’s market and the Slave Relics Museum during the day. At 6 pm that evening, the Colleton County Council will read their proclamation in celebration of the week and this will be followed by a 7 pm reception at the Colleton Museum. Queen Quet, Chieftess of the Gullah/Geechee Nation (www.QueenQuet.com) will lead a special ceremony honoring the Emanuel 9. She will be joined by the Colleton County Mass Choir. On Wednesday, July 29th and Friday, July 31st, everyone is encouraged to take the Dayclean Journey Tour in Savannah, GA and to support Gullah/Geechee businesses in Chatham County and the Coastal Empire. 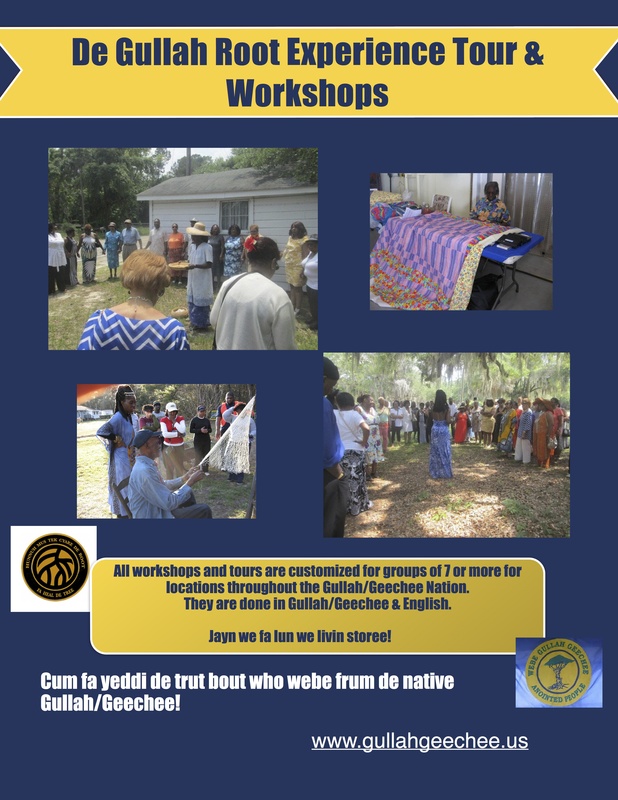 De Gullah Root Experience Tour will be conducted for groups that register during the month of July prior to Gullah/Geechee Nation Appreciation Week and on the morning of July 30th. To obtain information for a group, email GullGeeCo@aol.com or go to www.gullahgeechee.net or www.gullahgeechee.us. 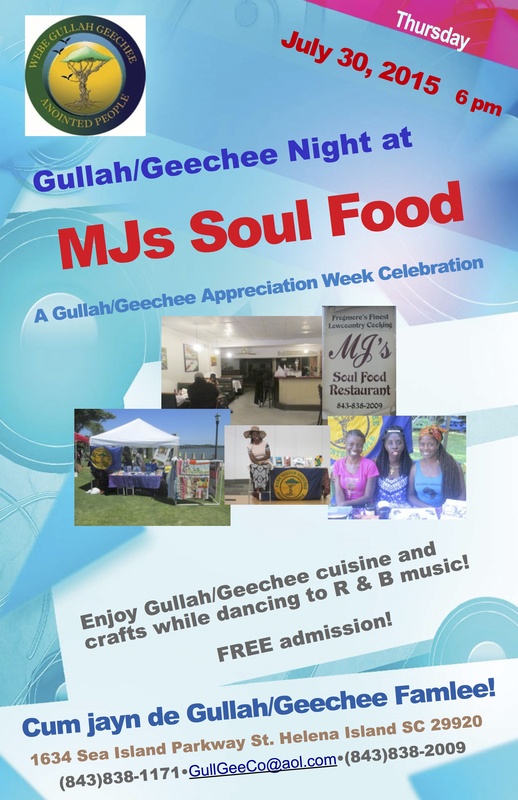 “Gullah/Geechee Night at MJ’s Soul Food” will take place on Thursday evening: The culminating event of “Gullah/Geechee Nation Appreciation Week” will be the 10th Annual “Gullah/Geechee Nation International Music & Movement Festival™” at Geechee Kunda. The Saturday of the festival is always “Gullah/Geechee Reunion Day.” Gullah/Geechee families are encouraged to come out and be a part of “Time fa Shout!” All week citizens of the Gullah/Geechee Nation are encouraged to wear Gullah/Geechee T-shirts and patches and to wave and display their Gullah/Geechee Nation flags. 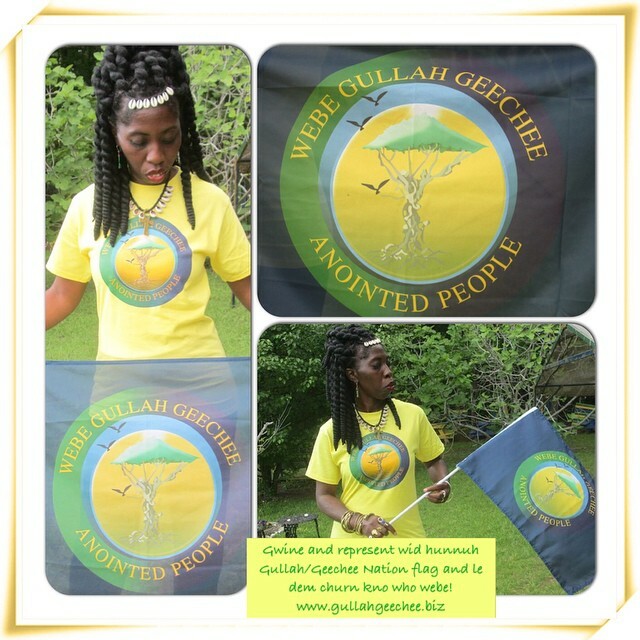 If you do not have one and would like to order one in time for the celebration, gwine ta www.gullahgeechee.biz. 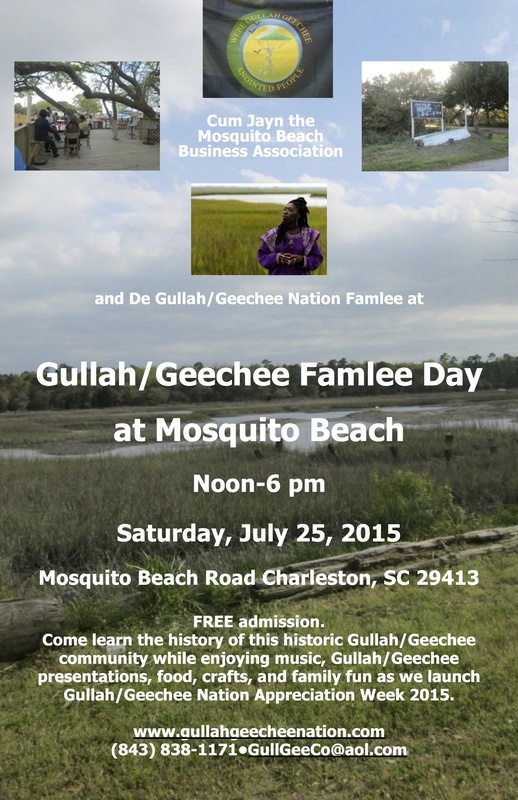 We gwine hep de Gullah/Geechee famlee keep de culcha alive pun disya land een de Gullah/Geechee Nation fa tru! E time fa yeddi mo and appreciate wha e do! 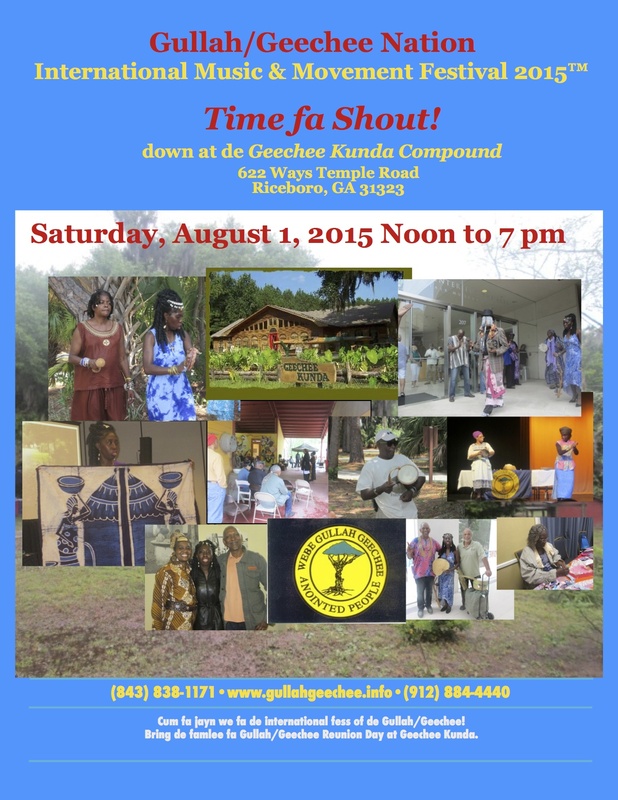 ← De Gullah/Geechee Nation Season of Celebration een De Conch!